Families do all sorts of things and siblings travel near and far. My oldest brother left for the left coast one day before cell phones and easy communication (though much easier than previously). Letter writing happened on rare occasions and visits were a once or twice in a decade sort of thing. Clearly, he never forgot the two of us left behind because care packages started arriving. Give Paris One More Chance!! Ken received them first, no doubt because of his greater claim on actually knowing something about music. You see, they were records. Soon enough, I made known my need to be included in the loot. I don;t recall ever getting first dibs. At least, I started getting the leftovers after anything choice was extracted. Then we started getting separate shipments as I attained an age and level of knowledge where I actually recognized some of the contents. The reality is that Barry worked in the bowels of MCA and we were getting promo copies of their releases. I don’t know how he made decisions about what to send or even what he started out with. To be frank, there was a lot of crap. Imagine all the contents of $.49 bins in the 80’s and you get the idea. But there was also Pink Floyd and Lynyrd Skynyrd and enough other stuff that you just never knew what to expect. A few one hit wonders appeared and it became pretty obvious that the one hit was all there was ever going to be. We didn’t traffic in singles. I never discarded any albums on sight and tried out everything. I never was very good at predicting my own taste. The cover pictured here peeked out from one package and I did not have high hopes. That first song though… That Summer Feeling. It blew me away. To this day, I can little explain the appeal. That’s not a knock- that’s just that I really liked it from the start. I played the record for other people and knew when they got it. You could see that smile on their faces. Because Richman just reached in and touched your heart. 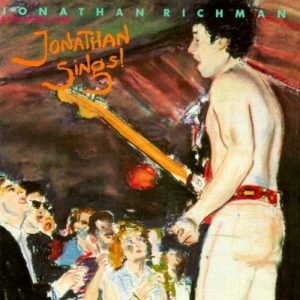 So, there was this deep catalog of Jonathan Richman’s music as he traveled from label to label, creating all sorts of incredible music. Sometimes, he seems incredibly popular, like when he appeared onscreen in There’s Something About Mary, which was a treat because I could use that as a pointer. Rolling Stone called Richman and his various incarnations something like naive rock. That seemed offensive, but mostly because it seemed like that was the intention. It’s not necessarily inaccurate and I’ve grown accustomed to the looks of people who think I must be insane thinking so highly of this artist (or any of the myriad others that I admire). Your loss. When Harpo Played His Harp!! In just a few days (back in March when this is published), I’ll be going to see Richman live at a local bar. This is already a highlight of my year. I’ve seen him twice before, but this is a first for my son. One of the first songs I taught him to sing was Richman’s composition, When Harpo Played His Harp, which naturally led to a few Marx Brothers movies. The thing we start to forget about naivete when we get so learned is that it can be a choice. It is specifically the choice of open arms and showing folks around your home, your heart and your art. You’ve Got to Check This Out is a blog series about music, words, and all sorts of artistic matters. It started with an explanation. 5 more to go.